The Pacific Coast Bicycle Route stretches from the border of Washington and Canada all the way to the border of California and Mexico. 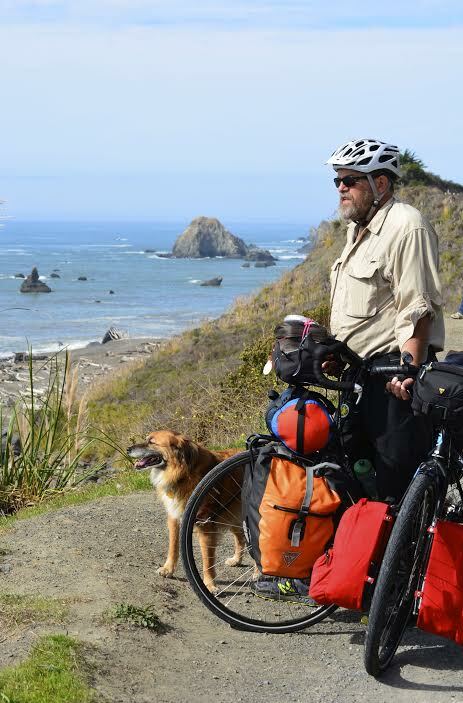 My partner, Tom, and I cycled the portion from Eugene, Oregon to San Francisco, CA last October with our 40 pound Australian shepherd mix, Indy. There are many reasons people set out on the Pacific Coast Route. For one, it’s one of the most scenic cycle tours in the world, and we met several international cyclists on our trip. It’s also a challenging route with huge elevation gains, making it a favorite for fitness junkies. 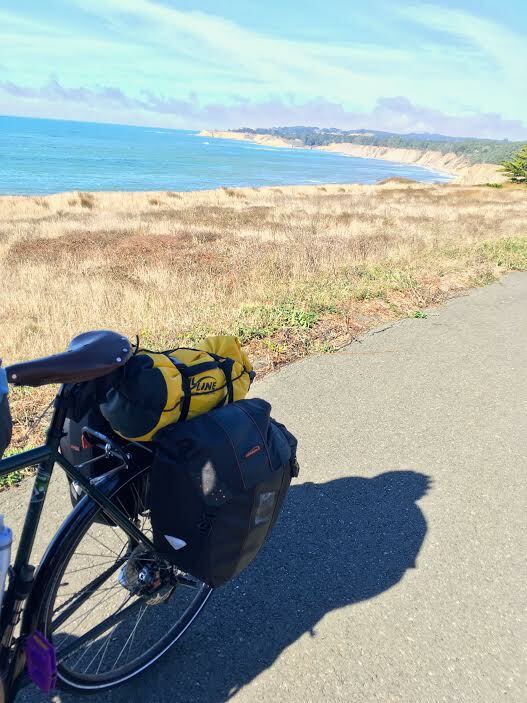 Another reason to choose the Pacific Coast Route over other routes in the states is the fact that it goes through many of the most bicycle-friendly cities and towns in the country, so there are a lot of resources available for cyclists along the way. We chose the Pacific Coast Route primarily for the beautiful coastal scenery, and it’s proximity to our home city of Eugene, Oregon. However, we did not consider that for our first bicycle tour (with a dog!) it maaaaay have been a bit advanced. Pulling 75 pounds (the total weight of Indy plus his doggie bicycle trailer) of extra weight up and down the steep coastal hills proved to be the hardest physical challenge I’ve ever attempted. The best time to cycle the Pacific Coast Route depends on whether you prefer lots of rain or lots of traffic. The Pacific Coast bicycle route shares most of it’s roadway with the Pacific Coast road trip route, which means that in the summer the traffic is very heavy. In the winter there is likely to be constant rain until you reach Southern California. It’s generally recommended that cyclists try to make the trip in the spring or fall for the best conditions. 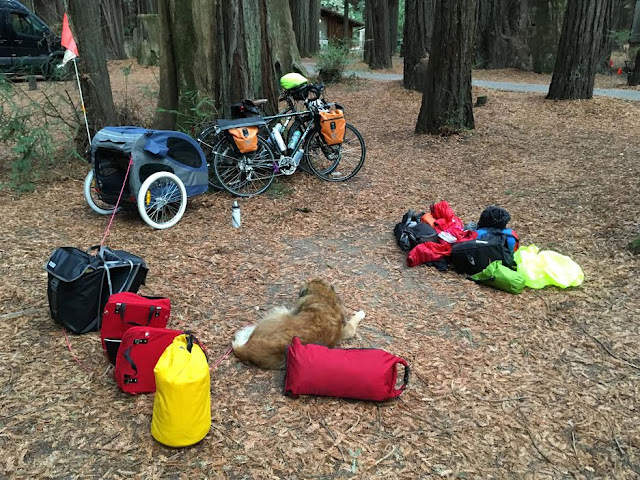 We cycled the Pacific Coast Route in the fall (September/October), but it happened to be an extra rainy year, and it rained on us most of the way. This was particularly difficult with the dog, as it was hard to ever get him fully dry! With that said, there was still quite a bit of vehicular traffic when we cycled, so I certainly wouldn’t recommend cycling the route in summer, the height of tourist season. We also met a few people on single and three gear bikes that were making the journey. I can’t imagine making it up some of the steep hills on a single gear bike, but it was inspiring to meet people doing just that! I like to think we inspired a few people with our doggie bike trailer in tow. Just as there were a myriad of bicycles on the route, the people cycling all had different reasons for their tours. Some had recently undergone a huge life transition (divorce, getting laid off, etc.) and needed a fresh start. Some cyclists were avid athletes and were trying to complete the route as quickly as possible (we were so slow we usually only saw these cyclists briefly). For some cyclists the Pacific Coast Route was just a small portion of a bicycle tour stretching from Alaska to the tip of South America! Soul-seekers, athletes, explorers, we met all types on our tour! For us, a bicycle tour felt like a challenge, as well as an organic, human-powered method of travel. When we cycled through beautiful areas we stopped and spent a few days exploring, we had no set end date, and chose to take our time enjoying the journey. Cycling the Pacific Coast Route was the most intense physical challenge of my life, and I am so glad that I did it. The journey taught me that I’m capable of so much more than I used to think, and I was able to experience the beautiful West coast at a slow enough pace that I could really take in everything I was seeing. I would certainly recommend this route to other cyclists who are considering a North American bicycle tour. If you'd like to learn more about Tom and Brittany's adventures, feel free to visit their blog The Rolling Pack.